Piqua City Schools superintendent Dwayne Thompson sakes the hand of Ohio State Highway Patrol Sgt. Dave Rosbison during a special award presentation at Thursday’s school board meeting. Robison, along with Troopers Jason Hutchison, Charlges “Chip” Gannon, and Tim Davis were recognized for their efforts in saving the lives of a pair of Piqua City Schools employees following a bus crash on I-75 in December of last year. Ohio State Highway Patrol Troopers Jason Hutchison, Charles “Chip” Gannon, Jim Davis, and Sgt. Dave Robison, l-r, pose with their awards for heroism presented by Piqua City Schools for the trooper’s part in saving the lives of Piqua City Schools employees following a crash on I-75 in December. PIQUA — During their meeting Thursday evening, amid a standing-room-only crowd, the Piqua City Schools Board of Education recognized three Ohio State Highway Patrol officers who assisted at the scene of an accident involving a Piqua school bus last month, in which two district employees were seriously injured. James Davis, Chip Gannon, Jason Hutchison, and David Robison were honored for assisting bus driver Cayley Seitz and aide Harold “JR” Raybern Jr. in the four-vehicle crash, which occurred on Dec. 14, and shut down southbound I-75 for nearly two hours. Seitz was trapped briefly on the bus, which was on fire. She suffered fourth-degree burns, which necessitated the amputation of part of her foot and toes. Raybern continues to use a wheelchair. Both have been in and out of the hospital since the accident, according to PCS Superintendent Dwayne Thompson. The troopers received plaques “for their heroic and selfless acts … we are forever grateful,” stated Board President Andy Hite. Both Seitz and Raybern attended the meeting and thanked the troopers for their bravery. “‘Thank you’ will never be enough. My babies will get to have a mom because of you,” said Seitz, who revealed that she is 12 weeks pregnant. Raybern called it a “miracle” that the troopers were nearby and able to get to the scene quickly. “If they’d been farther away, there’s a good chance we wouldn’t be here,” he said, adding later that he also was thankful to the district and his coworkers for their thoughts and prayers, cards and donations. In other business, Treasurer and Chief Financial Officer Jeremie Hittle presented the fiscal year 2019 mid-year review, saying that the district is operating in the black for the 11th year, with expected revenue on target and expenses slightly lower than expected. During the monthly update on student achievement, Erin Monnier, Kendra Fox, April Presser, Lauren Turner and Megan Johnson, educators from Springcreek Primary School, gave a presentation on the benefits of co-teaching, followed by students from Kris Mitchem and Maria Grassbaugh’s fourth-grade English Language Arts class reading fictional narratives done as part of a writing workshop. In honor of Board Appreciation Month, Thompson presented each of the five board members — Hite, Vice President Clint Bostick, Kelly McMaken, Sean Ford, and Frank Patrizio — with a certificate and a gift bag. “You do a great job of putting the students first,” Thompson said. The Board of Education’s next meeting will be at 6 p.m. Thursday, Feb. 21, at the board office, located at 215 Looney Road. BOE meetings can be viewed online at www.piqua.org/Boxcast.aspx. 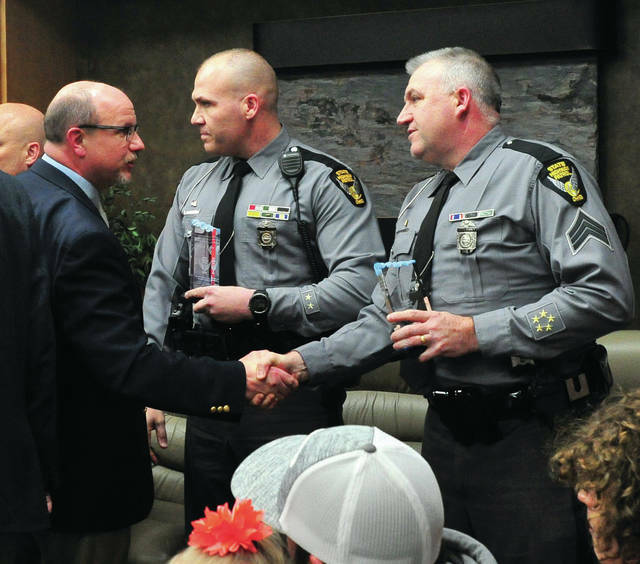 https://www.dailycall.com/wp-content/uploads/sites/30/2019/01/web1_012419mju_pcs_osp_trooperawards2.jpgPiqua City Schools superintendent Dwayne Thompson sakes the hand of Ohio State Highway Patrol Sgt. Dave Rosbison during a special award presentation at Thursday’s school board meeting. Robison, along with Troopers Jason Hutchison, Charlges “Chip” Gannon, and Tim Davis were recognized for their efforts in saving the lives of a pair of Piqua City Schools employees following a bus crash on I-75 in December of last year. 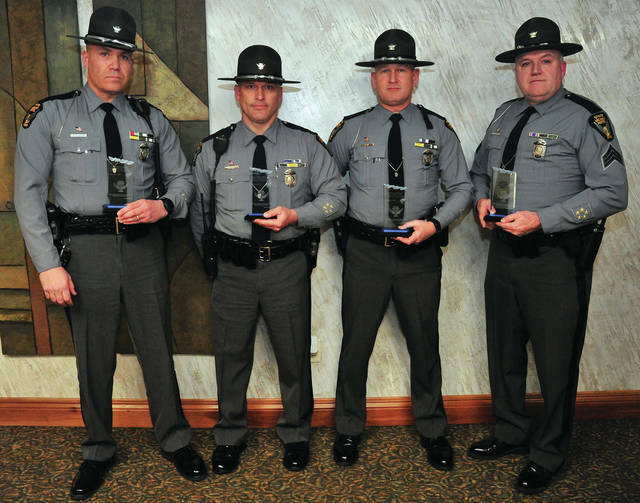 https://www.dailycall.com/wp-content/uploads/sites/30/2019/01/web1_012419mju_pcs_ops_trooperawards1.jpgOhio State Highway Patrol Troopers Jason Hutchison, Charles “Chip” Gannon, Jim Davis, and Sgt. Dave Robison, l-r, pose with their awards for heroism presented by Piqua City Schools for the trooper’s part in saving the lives of Piqua City Schools employees following a crash on I-75 in December.